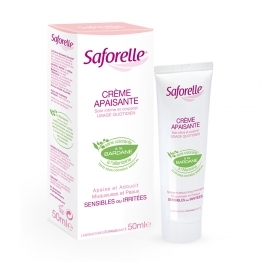 Cream soothing and anti-irritant. Itching and irritation of mucous membranes and sensitive skin. Based cream Burdock, known for its soothing activity, calming and cleansing enriched with moisturizing and softening agents is designed to soothe the itching and irritation of mucous membranes and sensitive skin. Apply morning and evening or at the request if necessary, after cleaning and drying the surface to be treated. - Glycolic extract Burdock (2%) (dynaphytols) - Moisturizing agents, - Softeners. Aqua, Glyceryl Stearate, PEG-100 Stearate, Paraffinum Liquidum, Sorbitol, Caprylic / Capric Triglyceride, Arctium Lappa, Cyclomethicone, Phenyltrimethicone, Glycyrrhetinic Acid, Triethanolamine, Tocopheryl Acetate, Carbomer, Phenoxyethanol, Methylparaben, Butylparaben, Propylparaben, Ethylparaben, Methyl Chloroisothiazolinone , Methyl Isothiazolinone, Cetyl Alcohol, Parfum (Fragrance), cinnamyl Alcohol, Citral, Citronellol, Coumarin, Eugenol, Geraniol, Hydroxycitronellal, D-Limonene, Linalool, Allantoin, Lavandula Officinalis Oil. Hypoallergenic.